It has been a long time since the last of these classic “set piece” battles, which generally took place in a single day, on a field measuring at most a few miles across. In the world wars of the last century, battles turned into massive affairs that could devour huge stretches of land and last for months—think of the Somme, or Stalingrad. More recently, in a world of American military dominance, shadowed by nuclear weapons, large-scale clashes between roughly matched modern armies have virtually disappeared, the last ones taking place during the Iran-Iraq war of the 1980s. America, in its “shock and awe” campaigns in the Middle East, the Balkans, and Central Asia, has not fought battles as an older history understood the term. The age of battles is over. The age of battles is over. For this very reason, historians can now look back on the classic set piece battles of the past and fully appreciate what a strange phenomenon they were. For a start, as evolutionary biologists like to point out, humans have an inherited disposition to avoid anything like an open, fair fight against a well-prepared adversary. Instinctually, we prefer surprise attacks, ideally with overwhelming force. Fights from which we cannot flee are worse, and fights where we have no direct contact with the enemy—perhaps cannot even see him—test to the limit our control over our natural impulses. Standing under fire is surely one of the most unnatural things human beings have ever been asked to do. Back in the age of classic battles, getting men to do it required a combination of savage discipline, the distribution of alcohol immediately beforehand, and endless, mind-bruising, behavior-altering drill. In World War I, military police had a simple method for identifying possible deserters: they shouted standard drill commands, looking for the involuntary, jerking muscular response that drill-weary soldiers could not manage to suppress. Whitman’s book does express a lament for the past, but he is a legal scholar, and it is a lawyer’s lament, not a soldier’s. He argues that for a long period of time, roughly from the early eighteenth century to the mid-nineteenth century, battles paradoxically gave Western civilization a surprisingly effective means of restraining war’s overall destruction. This was the case because the Western powers saw battle as an “accepted legal procedure,” and agreed to abide by the result. To achieve their desired military goals, countries did not need to annihilate an enemy’s army, still less to ravage his territory and civilian population. They needed only to force him to retreat from the field of battle, thereby achieving a “legitimate” victory that diplomats would take fully into account at subsequent peace negotiations. The Western powers accepted these rules of the game, Whitman contends, even when it cost them dearly to do so, giving as his chief example Prussia’s seizure of Silesia from Austria in the 1740s. Historians have often assailed Prussia’s Frederick the Great for this supposedly “criminal,” wanton, aggressive action, but Whitman will have none of it. Frederick’s contemporaries, he insists, including even Empress Maria Theresa of Austria, accepted the conquest as legitimate because of Frederick’s decisive victories at the battles of Mollwitz and Chotusitz. Battle amounted to a “princely trial by combat,” and victory had the status of a binding legal verdict. This is an argument that “realists” should seize on with delight. Whitman buttresses it with massive erudition, stiletto-sharp logic, and the heated, repetitive eloquence of a master litigator addressing a jury. Throughout his book, he casts the work of previous scholars as romantically naïve, lazily conventional, wrong, “false,” even “flat-out false.” (That last charge is directed at me, for characterizing a jurist’s attention to issues of justice more narrowly than Whitman himself.) 2 But The Verdict of Battle reserves its harshest verdict for the modern lawyers and diplomats who willfully refuse to see that even as they themselves “have grown more and more committed to humanitarianism ... wars have only gotten worse.” The book challenges these men and women to step back and realize that their good intentions may often have perverse consequences, and that, seen in the broad sweep of history, their assumptions and strategies are not self-evidently enlightened and correct. A book that devotes so much time to Central European battles of the 1740s, and to legal luminaries whose careers pre-dated the American Revolution, will probably attract few readers in the Department of State or the United Nations. Yet the denizens of those institutions could do worse than to read this book and ponder its conclusions. At the same time, though, they should exercise caution. Whitman has written an often brilliant book, but in his zeal to win his case he tends, in good lawyerly fashion, to push inconvenient evidence to the side. And there is quite a lot of inconvenient evidence. For all its analytic power, The Verdict of Battle depends on a surprisingly narrow and lawyerly vision of what war was like in the age of classic set piece battles. Whitman depends on a surprisingly narrow and lawyerly vision of what war was like in the age of classic set piece battles. Here is one example. Whitman assumes that the period’s rulers fought wars mostly in straightforward pursuit of material gain, especially territory. These rulers emerge from his pages as sober, hard-headed, goal-oriented rational actors, in contrast to today’s lawyers and diplomats, with their fuzzier, more open-ended humanitarian goals. Of course, the proper distribution of spoils is what the lawyers and diplomats principally concerned themselves with. But did the rulers themselves really fit the same mold? As Whitman himself notes at length, the rulers fully understood how much in battle depended on sheer chance, and viewed each set piece confrontation as a “wager” on which the fate of their entire kingdoms might depend. Was this a rational way of managing a state? Frederick the Great himself came perilously close to losing everything during the Seven Years’ War of 1756–1763. Only the chance accession of a German-born admirer to the Russian throne saved him from catastrophe. Moreover, these supposedly rational actors rarely did very well when it came to calculating war’s profit and loss. For nearly all eighteenth-century states, war amounted to a ruinously expensive venture. It was impending state bankruptcy, due largely to uncontrolled military spending, that triggered the French Revolution of 1789. Piecemeal gains in territory and treasure rarely made up for these tremendous outlays and risks. Yet if the period’s princes were very bad at balance sheets, they had an exquisite sense of how to measure something far less tangible than money: military glory. Whitman admits that “war-making in the eighteenth century ... was undertaken in the interests of princely glory,” but he comes to this admission just thirty pages before the end of his long book, and devotes far less attention to the subject than he does to material gain. For a ruler such as Louis XIV, France’s “Sun King,” who fought war after war even after it wrecked his country economically and decimated its population, but paid famous attention to the image of his glory and to all manner of royal display, perhaps the ratio should have been reversed. In making this argument, however, Whitman falls prey to a basic misconception. He is perfectly right to point to the end of independent, rebellious aristocratic power after the rise of absolute monarchy. But he is wrong to assume a fundamental antagonism between aristocrats and monarchs. However much the latter subjugated the former politically, in social and cultural terms they did nothing of the sort. Indeed, sometimes something of the reverse was true. Both sides participated in elaborate systems of court ritual and etiquette, and also ambitious projects of economic improvement, public order, and artistic display from which both derived enormous wealth and status. The same royal troops who deterred aristocratic rebellion also defended aristocratic estates against rebellious tenants. The same officials who collected royal taxes most often provided aristocrats with a healthy cut. The period’s relatively restrained and limited style of warfare did not reflect the value system of rebellious, independent aristocracies. It reflected the value system of powerful, wealthy aristocrats who had re-defined themselves as loyal servants of their sovereigns, but remained in positions of social and cultural dominance. And the allure of aristocratic duels endured, even if only kings now had the right to fight them. Whitman also places too much stress on the example of German-speaking Europe, returning again and again to the single case of Frederick the Great’s seizure of Silesia. Yet the German states had a peculiar relation to each other, since they also belonged to larger political units: the Holy Roman Empire in the eighteenth century, and the German Confederation in the nineteenth. Both of these entities, while largely toothless, did provide a larger legal framework for their constituent parts, encouraging a legalism and litigiousness between them that had little equivalent elsewhere in Europe. In the case of Silesia the losers attributed legal force to military victory, yet one could adduce other important cases from early modern Europe where they did not. After King James II of England lost his throne in the Glorious Revolution of 1688, and the subsequent War of the League of Augsburg, his French allies refused to abide by the result for some sixty years. When James died in French exile in 1701, his host, Louis XIV, promptly recognized his son as James III (the “Old Pretender”). Given all these exceptions, it might make more sense to see Whitman’s law of victory less as the actual practice of European states than as an ideal to which lawyers, diplomats, and sovereigns aspired, and sometimes managed to translate into fragile reality. But at other moments they failed; and by the late nineteenth century, in Whitman’s telling, they had failed completely. 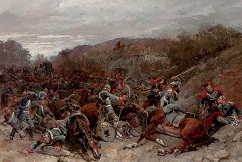 Starting with the Franco-Prussian War of 1870–1871, the idea of battle as a princely trial by combat not only ceased to appeal, but became practically unintelligible to nearly everyone in the Western world. Whitman’s law of victory is less the actual practice of European states than an ideal. Not coincidentally, it was precisely during this half century that a series of international conferences—most importantly those at the Hague in 1899 and 1907—tried for the first time to codify what today’s jurists call the “laws of war.” Contrary to what is often thought, these conferences were not the work of starry-eyed utopians. As the historian Peter Holquist shows in forthcoming work, the men in question were hard-headed legal realists. Many of the most important were faithful servants of the Russian tsar, and believed less in the rule of law than in the autocratic principle of ruling through law. Arguably, it was precisely at the moment that the older legal ideal of the “law of victory” lost its last shreds of legitimacy that these jurists felt the need to develop a new formal code governing such matters as the rights of occupying powers, the definition of war crimes, and so forth. Of course, this new code did depressingly little to restrain the savage total wars of the first half of the twentieth century. In these circumstances, an intelligent book such as The Verdict of Battle, which reaches back into history to provide a genuinely different perspective on warfare, deserves a serious hearing. Despite the book’s claims, readers will not find in it a picture of how the international system as a whole actually functioned in the age of classic battles. And with that age now vanished, the book will not provide anything like an exact model to restore, either. Observers frustrated with the international community’s repeated failure to prevent eminently preventable outrages may question many of Whitman’s conclusions. Still, his book offers a valuable, sober-minded lesson. In some circumstances, at least, it makes more sense to accept the result of violent conflict than to spend decades disputing it, in a cycle of frustration and hatred that simply generates ever more violence and hostility and suffering. A sober and carefully codified recognition of victory, particularly when the victor displays a degree of magnanimity, and agrees to negotiation, is not always a surrender to the law of the jungle. In their understanding of this point, the princes and the soldiers who paraded across battlefields in their gaudy uniforms two centuries ago possessed a degree of wisdom that we would do well to recover. Stanley Kubrick’s Barry Lyndon (1975) gives a vivid picture of an eighteenth-century battle, although only on the level of a small skirmish. In fact (full disclosure) one of Whitman’s principal targets is my own book The First Total War: Napoleon’s Europe and the Birth of Warfare As We Know It. For an example of these debates, see the opposing points of view of David Rieff and Anne-Marie Slaughter on intervention in Syria. Many more such pieces can be found in this “Document Archive” of the International Coalition for the Responsibility to Protect.